Note: This frosting requires a little bit of advanced planning because the butter infuses for a few hours to get as much rosemary flavor as possible. Believe me, it is 100% x 1,000 worth it. Melt 1 cup butter in a saucepan, add the rosemary and cook for 30 more seconds on low heat. Transfer the melted butter and the rosemary to a bowl and let steep at room temperature for at least 3 hours. Strain out the rosemary and transfer to the infused butter to the fridge to resolidify. Preheat oven to 350. Line cupcake pans with 24 paper liners and set aside. Combine the dry ingredients in a large bowl and whisk to combine. Combine the eggs, vanilla, buttermilk and canola oil in the bowl of a stand mixer fitted with the paddle attachment. Beat until well combined. Sift in the dry ingredients (it's always worth taking the time to sift when you're making chocolate cake. Cocoa powder makes for some nasty lumps) and mix on low speed until just combined. Scrape the bowl well. Add the hot coffee and mix on low to combine. Pour the cupcake batter in the prepared pans, filling each cup 3/4 full. These sink in the middle if they are overfilled, so be a little light handed. Bake 20-23 minutes, until a tester inserted in the center comes out clean. Let cool in the pan for 10 minutes before turning out onto a wire rack to finish cooling. Once the infused butter has solidified to a room temperature consistency, it's time to make the buttercream. Beat the rosemary butter with 1 additional stick of room temperature butter until smooth and light, about 3 minutes. Scrape the bowl and beat in the powdered sugar until combined. Add the vanilla, cream and salt and beat for 3-4 minutes, until buttercream is light and fluffy. Frost the cupcakes and sprinkle with sanding sugar, if desired. I completely covered mine in sugar because it look like snow and makes me so happy. 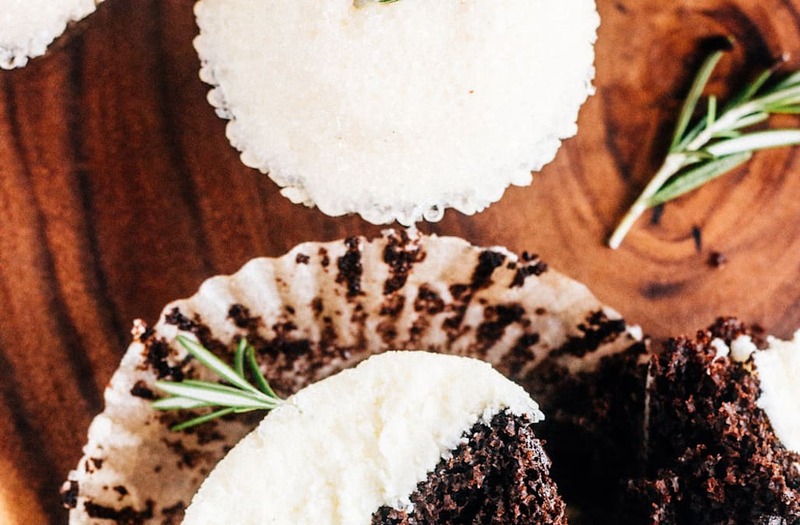 Top each cupcake with a small sprig of rosemary.